I have nothing terribly exciting to say today; so, just a quick post. I am finding that breakfast is the hardest meal to make well rounded and healthy (only because I am trying to do 8,000 things in the morning before I leave to see patients!) When I had a dozen hard boiled eggs ready to go in the beginning of the week, it was a no brainer, but we ate those quickly. My usual breakfast pre-Whole 30 was a Primal Fuel shake on the way to work. We ordered the Primal Fuel from Mark Sisson of Mark’s Daily Apple. It is a really healthy shake, made with coconut milk, but since I’m not positive its Whole 30 compliant I have been making my own smoothies in the blender. 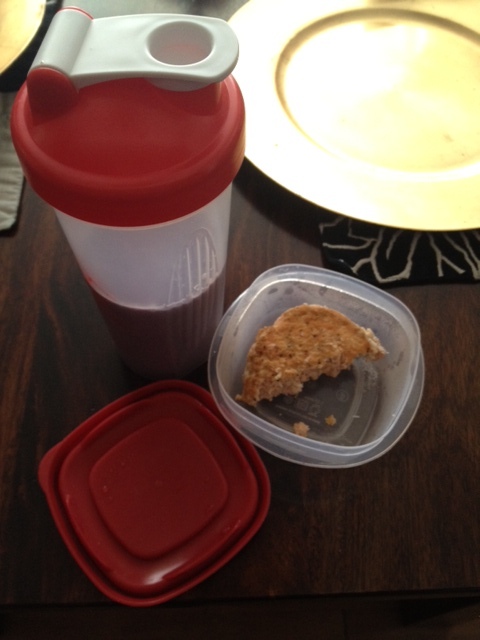 So, this morning (again) I had a smoothie on the way to work, and also ½ salmon patty from dinner. I worked all day, so lunch was another full salmon patty, an apple and macadamias. 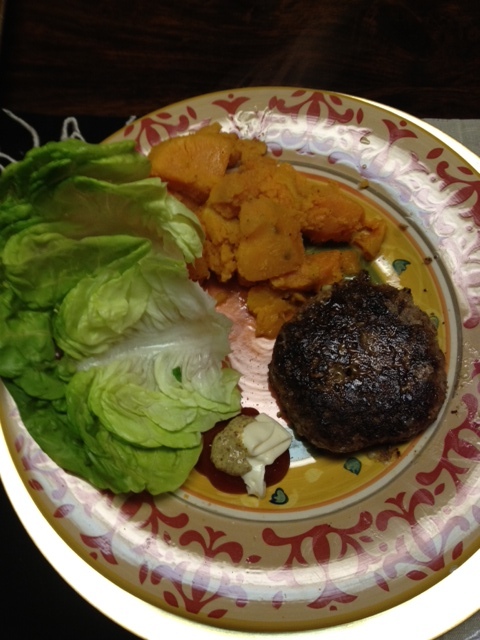 Dinner was one of my favorite meals – Dave’s burgers! My hubby makes the best burger ever. We ate them on lettuce buns (as usual!) with sweet potatoes topped with ghee. Dave put the condiments on my plate, but I ended up only using a tiny bit of mustard, since the catsup had sugar in it (grrrr…..even though it is organic). My goal over the weekend is to do more cooking so that I have easy to grab breakfast meals next week. Are you doing The Whole 30? If so, leave me a comment so I can hear how you are doing! Hi! I am on Day 9 of Whole 30 and loving it so far! It does take a bit of pre-planning. Of course, my husband, friends, and family all think I’m nuts. But I’m feeling great! I have issues with staying asleep, so I’m hoping this will help me sleep better. I hope the sleeping issue is improving! Keep me posted! I’m actually sleeping great, and waking up at 6:30-7am ready to get up – that has never happened in my whole life!